I make this salad weekly. How am I just now getting around to sharing it? We just got home from a week cruising down the coast of Mexico. 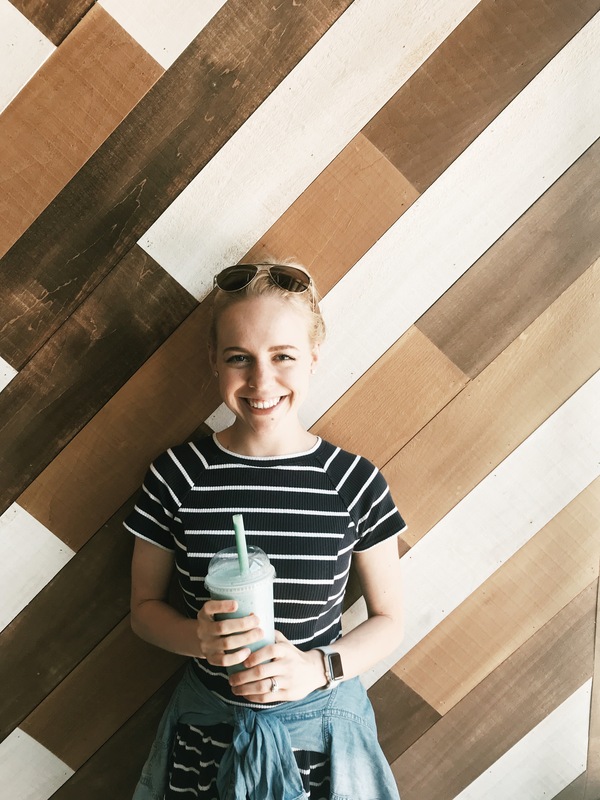 It was a beautiful, relaxing vacation full of so much good food + new experiences. But I sure am glad to be home and back to a normal routine. If you’re like me, after days of eating indulgent food, you crave a simple, fresh, leafy salad. 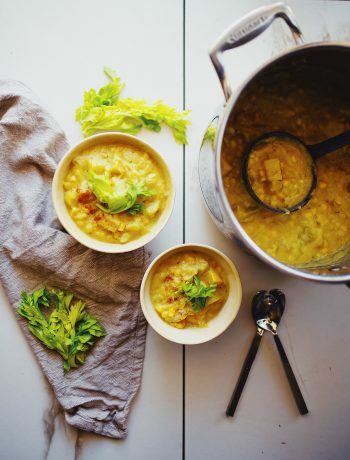 This recipe is always a go-to for me. 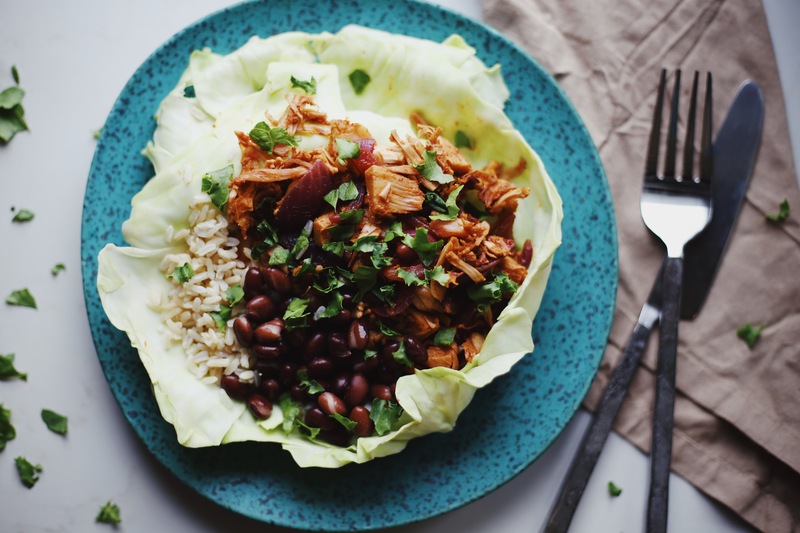 It pairs with basically anything, is so easy to make, and leaves you feeling nourished + satisfied. 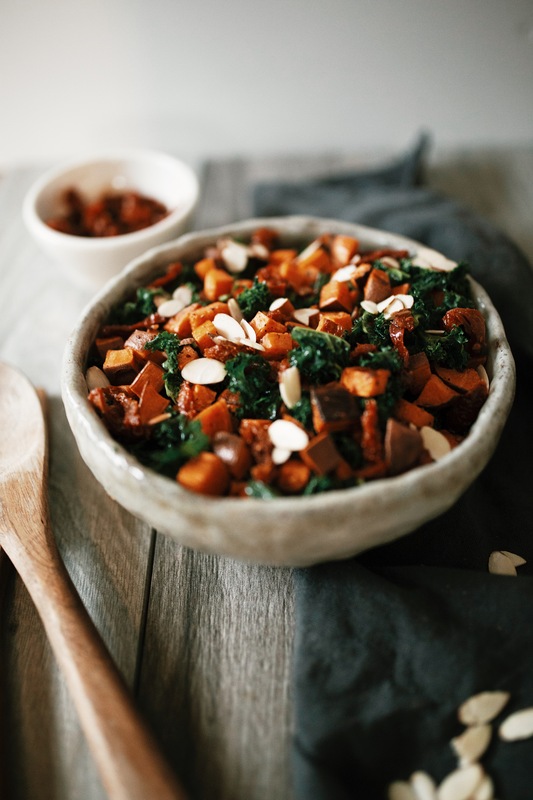 Let’s make my Sweet Potato + Sun-Dried Tomato Kale Salad! This salad is basically a lazy-girl’s dream. Its the perfect lunch on a busy day or simple side for a dinner party. While the sweet potato roasts, assemble the salad. Toss all the ingredients together and you’ve got yourself the perfect salad in just 45 minutes. 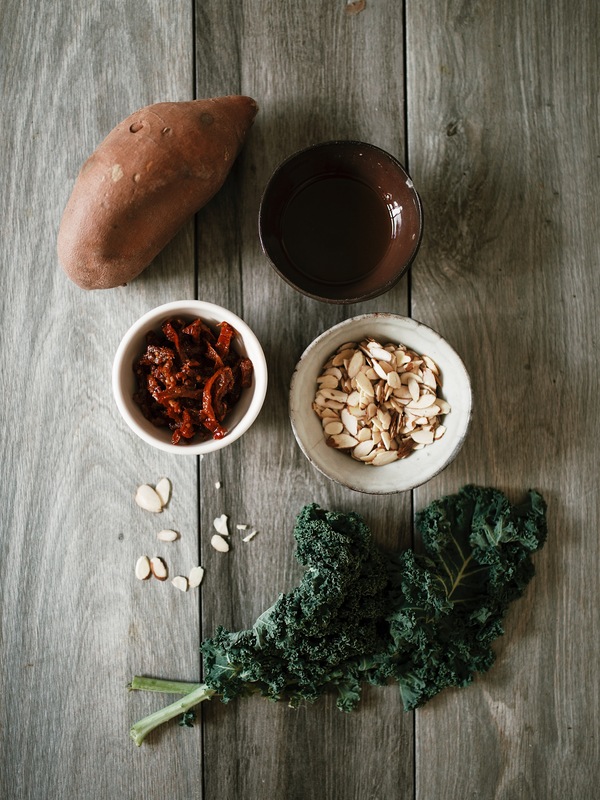 The combo of the crunchy kale, soft sweet potatoes, and chewy sun-dried tomatoes is irresistible. 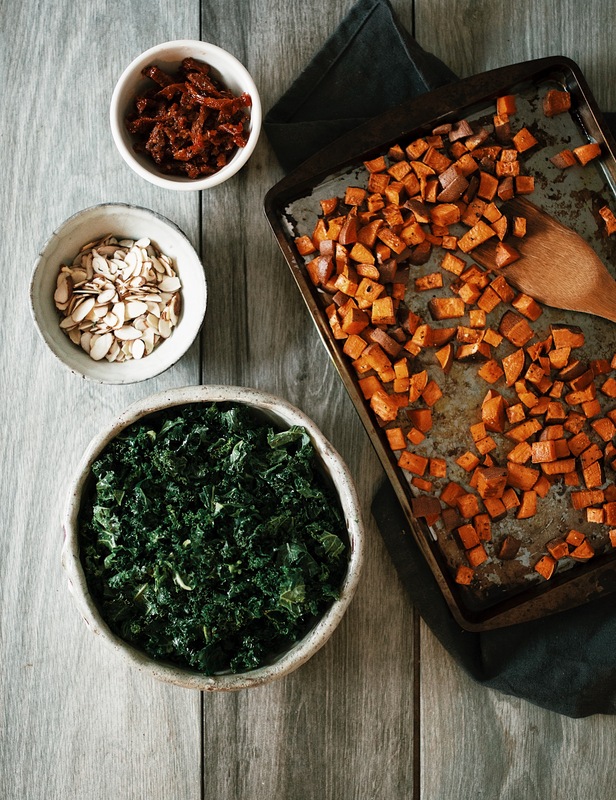 The flavors of the naturally-sweet sweet potato, tangy apple cider vinegar, and the bitter kale make it versatile and ready to pair with any meal. This simple salad is the perfect lunch on a busy day or simple side for a dinner party. 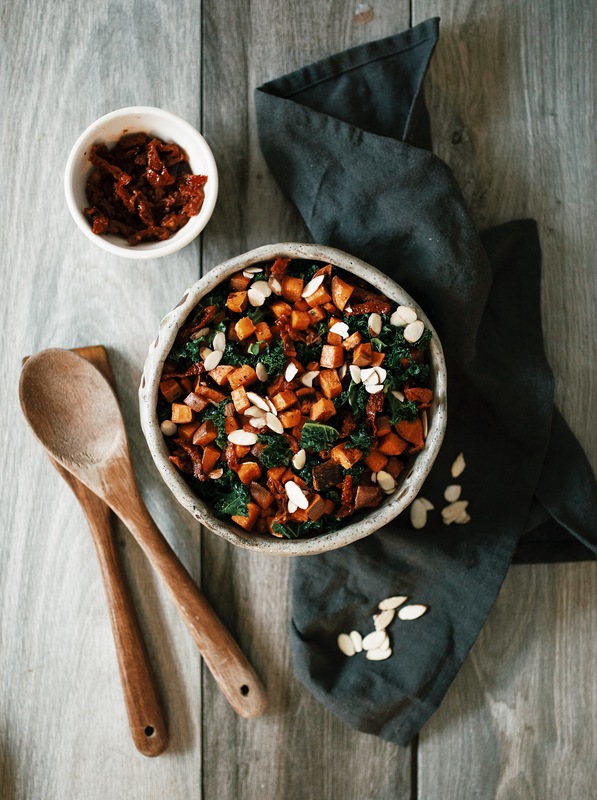 My Sweet Potato + Sun-Dried Tomato Kale Salad is nourishing, flavorful, and so easy to make! 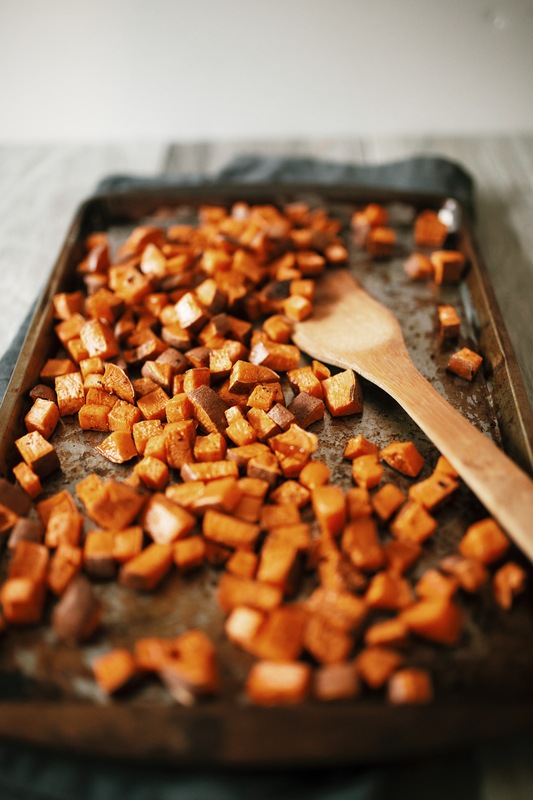 Spread the diced sweet potato across a large baking sheet. Drizzle with 2 Tbsp. of the olive oil, sprinkle with salt and pepper, then toss to coat. Roast for 35-40 minutes, or until potatoes are soft with crisp, dark edges—tossing halfway through baking to ensure evenness. 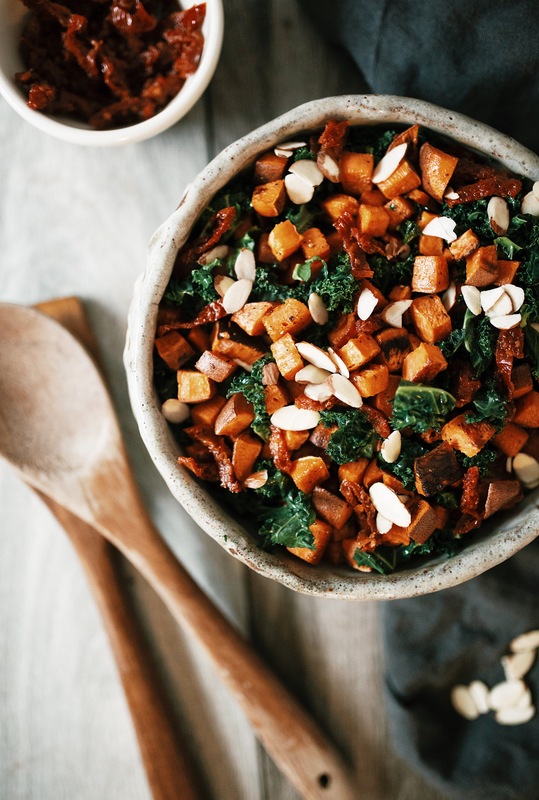 While the sweet potato bakes add the kale to a large bowl. Drizzle with remaining 2 Tbsp. olive oil, apple cider vinegar, and lemon juice. Massage kale until leaves are well coated. Once sweet potato is cooked, add to salad with sun-dried tomatoes, and sliced almonds. Toss until evenly mixed. Serve immediately or refrigerate until ready to serve—the salad tastes delicious warm or cold. Leftovers will keep for up to 3 days refrigerated in airtight container. 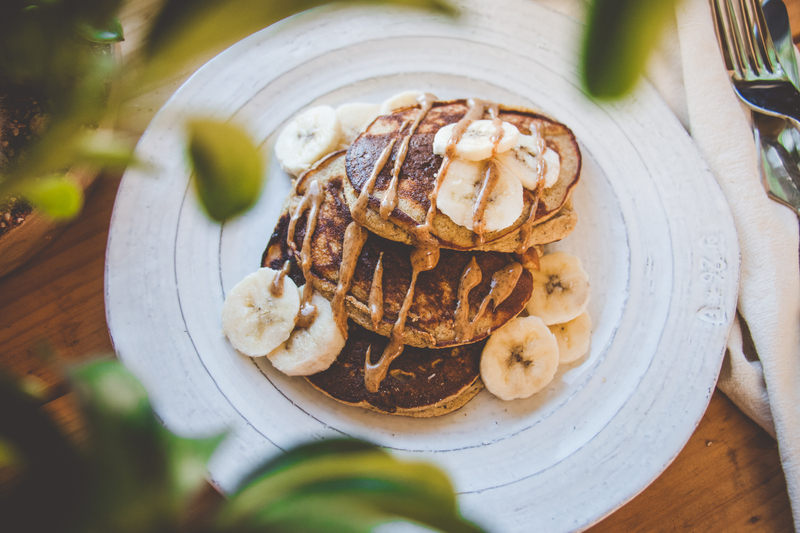 Nutrition information is a rough estimate of ¼ of the entire recipe.